Strong, distinguished facial features are the beauty ideal, but nature falls a little short for many of us in Orange County. Chin and cheek implants are designed to subtly change the profile of your face, adding or restoring contour and proportion. Often, implants are used in conjunction with other procedures, such as rhinoplasty (nose reshaping) or a facelift. If you have weak facial features, facial implants can help. At the Newport Beach and Long Beach locations of CosmetiCare, our plastic surgery specialists understand that achieving the look you want can help you live the life you want. Learn more when you request a consultation with one of our surgeons. Older patients that find a facelift can diminish a sunken look in their face and cheek implants can provide a more youthful appearance. Patients who wish to strengthen their profile and jawline. Patients who feel extremely self-conscious about the look of their facial features. 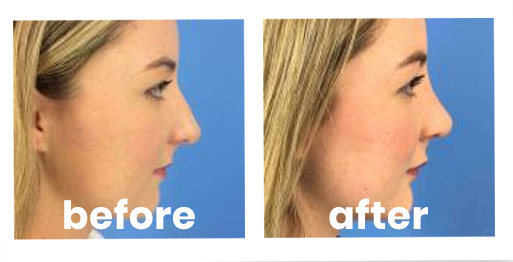 Patients wishing to compliment their nose reshaping procedure to create better facial balance. After inserting a chin implant, the patient’s chin is taped and wrapped from the chin up around the head to minimize swelling and discomfort. Talking, eating and smiling may be uncomfortable for the first few days. Sutures in the chin are removed after five to seven days. If an intra-oral incision is used, the sutures will dissolve usually within 10 days. After inserting cheek implants, mouth movement will be limited temporarily. It takes several weeks to see the results of your surgery, sometimes months, but patients find that the results are worth the wait. While patients feel ready to resume regular activities within a few days, activities that jar or bump the face should be limited in the first few weeks. Patients may return to work within a week after surgery. After surgery you should notice stronger, more well-defined facial features. Facial implants can also help you achieve better facial proportion and balance. Request a consultation online to learn more or to schedule your chin and cheek implants in Orange County. With convenient locations in Long Beach and Newport Beach, CosmetiCare makes it easy to look your best in Southern California.